A long-long time ago, way before the nature of time was even conceptualized; Bryan Hitch and Fernando Pasarin found themselves in the middle of Matt Ryan's living room, wondering what Brad Anderson was going to do for the following book. 'Should he dance with it? ', exclaimed one of them, whereas the other shouted out, 'Should he wear it like a hat?'. But don't worry, my friends, because he did neither of these things. As you can clearly see when you check out this double review of the Justice League. “Oh, no, not the Infinity Corporation again!” -- Yeah, that was pretty much my immediate reaction when I started to read issue 15 of Justice League. 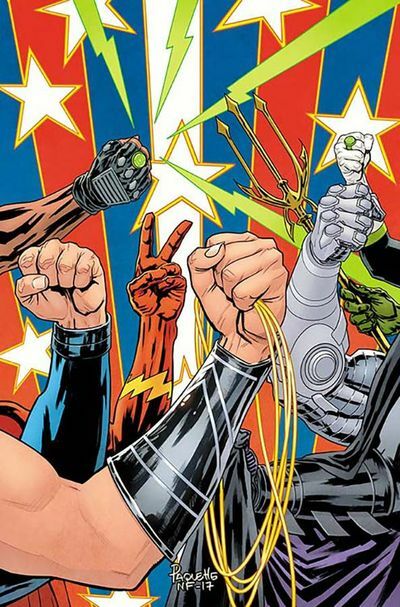 I was really hoping that after the sloppy interruption that was the Justice League vs Suicide Squad crossover event, spit-spit, that we'd finally get some strong, character driven, meaningful Justice League stories, in what, quite frankly, should be DC’s flagship title. I honestly wasn’t a huge fan of Hitch’s pre-Rebirth (in setting, at least) Justice League of America. The overall story arc and the concept of Superman meeting Rao was a great idea, but the execution left me decidedly underwhelmed. 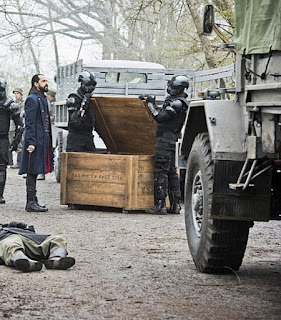 So, as you might have guessed, I cringed as I turned to the opening pages of the current story-line, Timeless, Parts 1 and 2. Yet, sure enough, I have never been so pleased to be so wrong about what to expect. This by far is a better laid out story than Hitch's previous efforts on Power and Glory. Despite it hopping all over the timeline (both in narrative and in story setting), it manages to lift the Infinity Corporation up from an ill-conceived tool for time-travel to a valuable addition to the DC Universe. These two issues give them an air of mystery and weight, keeping even the most cynical of us engaged with the story-turns. They may also have far more to do with the ongoing Rebirth story-line than I’d suspected. Maybe the original story pitch was interrupted by the company-wide event and we’re just now getting the story Hitch wanted to tell? 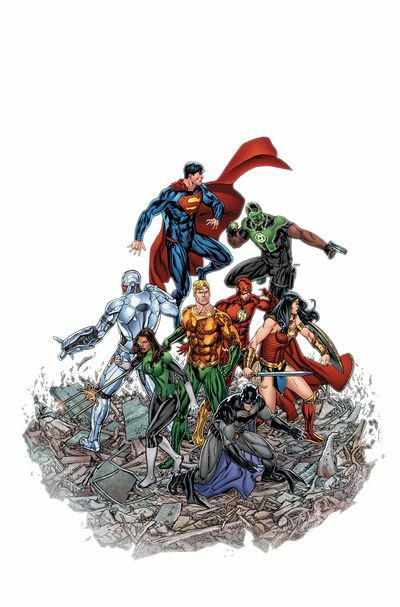 Or maybe JLA was just an excuse to introduce the group so there was a foundation for this story? Heck, maybe I’m the only one who was disappointed by JLA? [Editors Note: No you weren't] Either way, I doubt I’m the only one loving nearly every panel of Timeless. I’m probably not the only one taking multiple reads through it, either. With all the temporal leaps, it takes a couple of perusals to follow and understand things, especially if you’re reading the issues as they come out and not all in one sitting. Part 2, for example, starts up 10 minutes prior to the beginning of Part 1, which then proceeds to show “yesterday” where all the characters are flung around the timeline like they just got zapped with the Omega Sanction. Good times. One of the challenges for the creators of any team book (like Justice League) is to keep scenes from getting too crowded or having characters just standing around while the others do the heavy lifting. Fortunately Hitch and Pasarin manage to find a great balance to address this. Sure, we get a few battle-royale scenes showing the League fighting as a team. But we start with the team partially split up and then split them further, allowing the story to give each Leaguer their own scenes, jumping between them as the story gradually unfolds. Superman and Batman, of course, need to be squirreled away together for... uhhh... reasons. And while the exposition dialog of the Infinity Corporation’s call to arms could have easily come across like the gang hanging out in a suburban living room (I’m looking at you, issue 10! ), throwing said conversation in to a temporal storm allowed Pasarin to work wonderful background details like Alexis, Jane, Vincent, and Bats flailing and contorting all over the place (like an episode of Star Trek) while Supes strolls along all tall, casual, and confident, not offering a gesture of assistance as he goes. This particular detail worked quite well with Hitch’s ongoing development of Bats and Supes’ relationship, each having known another version of the other, and wanting to work with the other, but still seeing plenty of flaws in the one that still exists. And this particular story gives them plenty of chances to snipe at each other so that there’s no unspoken resentment to inexplicably get over. I don’t know what sort of magical combination of Pasarin, Ryan, and Anderson made it happen, but when Molly appeared, she looked like she jumped off the pages of a Jon Davis-Hunt book (You’re reading Simone’s Clean Room and Ellis’ The Wild Storm, right?). That’s definitely a compliment. Not that I have any problem with their regular work; most of the League looks rough and realistic in contrast to their more cartoony appearances in other books. I love their rendering of Superman in particular, though something about their Batman feels a bit off. The epic machinery of the Timeless also stands out and gives the sense of immense scale it needs to. But above it all, they deliver something very distinct in the art style of Molly to make her feel unique in the story, and appropriately so. There’s plenty of speculation to be had as to whether Molly is a character we may have seen before, perhaps in some other form, but for now I’m enjoying the concept of a Keeper, distinct from a Monitor (of which we are presumably down to one, unless Convergence’s prevention of Crisis on Infinite Earths changed that), and apparently on a tier of continuity omniscience with the late Metron and him-that-we-all-assume-is-Dr-Manhattan. 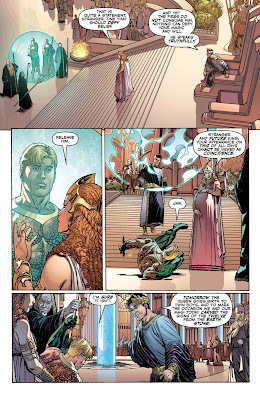 As these two issues close, the League is distributed across time and ready to face the Timeless. Each of them, save Barry, seem poised to recruit some temporally local muscle, but the heart of the story for me is with Supes and Bats at their unknown location at the periphery of a temporal storm. Beyond the ongoing relationship jabs between the two of them, the showdown poses a contrast that is at the core to both the story and their characters. Batman, who implicitly has nothing to lose personally from the threat of the Timeless, wants answers, solutions, and to work out logistics. Superman, on the other hand, is single-minded in his purpose to get his family back, skipping the detecting and flying right up to the final page to confront the Timeless for answers. But wait. Oa exists again?! Oops! I need to catch up on my Green Lantern titles. This arc is clearly centered around change. Someone (more on that below) is trying to change the world by eliminating super powers from five key points in time. Clearly the Justice League want to prevent this change, and Molly – who is omniscient enough to know about Crisis and Flashpoint and thus presumably who this Superman is and the as-yet-unrevealed secret to how he got to now – seems pretty keen on ensuring that it doesn’t happen either. Thus, the epic that is [Oingo] Boingo’s Change seems the appropriate musical pairing for these two books. The vague shape of this story so far keeps reminding me of Vandal Savage’s final gambit in the final episodes of the first season of Legends of Tomorrow. Instead of a literal “temporal bomb,” Savage was coordinating (with himself) to rewind time back to 1700 BC, via a vaguely explained combination of alien science, Egyptian blood magic, and just-go-with-it comic book faith that required action on three specific dates in time. 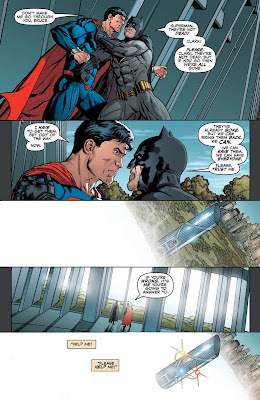 Like with our current Justice League arc, the team had to split up to stop him in these three different places in spacetime to prevent all of reality from ceasing to exist. Or some such blah-blah-blah. This story sure does give us a lot of teases of what it might be revealing down the road. Yet to its credit, it doesn’t rely on these teases. There is a great time-hopping save-the-world-as-we-know-it drama afoot. So, if you like -- or at least aren’t turned off by -- time-hopping save-the-world-as-we-know-it drama, then you’re in for a good time. But isn’t part of the fun in reading a review having a place to share your crazy theories about what might be coming next? Or at least mocking mine? So I’ve touched on Molly, and there’s the obvious tease about “who we really are and where we’re from” between Alexis, Jane, and Vincent, once Bats leaves to get Superman. I realize nobody shares a name with any of the members of prior incarnations (save for Jane Jones and Nicki Jones), but the obvious name of the Infinity Corporation aligns quite overtly with Infinity, Inc. Even without Metron’s indication that this reality “has not yet solidified,” we had pre-Rebirth indications that the current continuity has seen Kent Nelson, Alan Scott, and Sylvester Pemberton, with Rebirth and the series launched since then having confirmed Johnny Thunder, Natasha Irons, Dan Garret, and more. Could we not only have a version of the Justice Society in our story’s past but also a Infinity, Inc in it’s future? Oh, and then that guy shows up on the last page. You know, you can recognize him by the coloring of his dialog boxes, right? No, not the inner voice of the Phantom Stranger. Nor Blue Beetle’s scarab. Probably not Mister Nuclear and his blue wang. That other guy. The one from that other story. The big one that had nothing to do with Earth-0. The one whose progeny likely met Cyborg in this issue. Right? But not, like, now him. Some future-him or multiversal-him or some such that left him like … that. And with … slightly not-right clones?